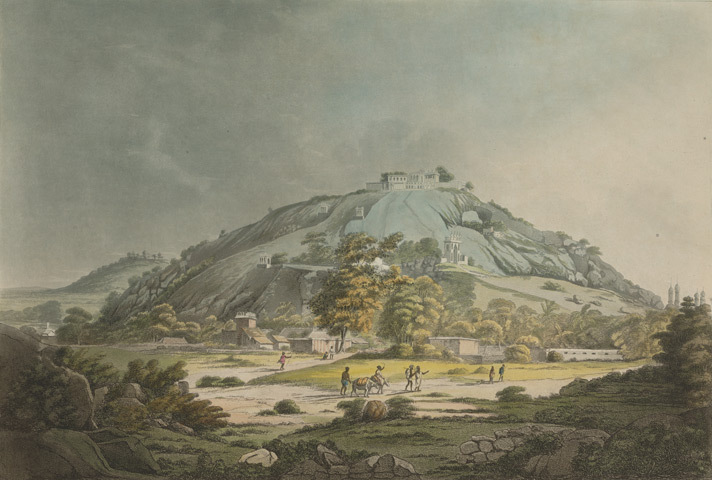 This is plate 3 from 'Hindoostan Scenery consisting of Twelve Select Views in India' by Francis Jukes (1746-1812) and Thomas Anburey (1759-1840) of the Corps of Engineers in Bengal. Anburey served with the Bengal Army as a surveyor in 1792 and 1793, travelling first from Seringapatam to Hyderabad, then on through Berar to Kalpi. His sketches of the journey included many views that British audiences had never seen before. The beauty of these prints does not convey the rigours experienced on the long march, which were contemporaneous with a series of regional battle against the local Muslim ruler Tipu Sultan, known as the Mysore Wars (1767-1792).